Since her appointment as Director of the School of Public Affairs at San Diego State University (SDSU), Dr. Sherry Ryan has been strengthening student involvement and increasing student interest in the Master of City Planning program. Inspired by their new leadership, students in the MCP program formed a planning student organization (PSO) in the Fall of 2017. The PSO is made up of more than 20 driven students that are passionate about their work at SDSU and the planning profession. This group is recognized by both SDSU and the California American Planning Association. As an initial endeavor, the PSO applied for and was awarded a Student Success Fee grant from SDSU to send its top planning students to the 2018 National Planning Conference (NPC) in New Orleans. Because the grant is intended to fund student success, the unique opportunity to send what accounts for almost the entire MCP student body to explore various planning ideas, learn from some of the most forward-thinking professionals in the field, and develop career skillsets and networks all offered at the NPC made this an ideal grant proposal for the PSO. 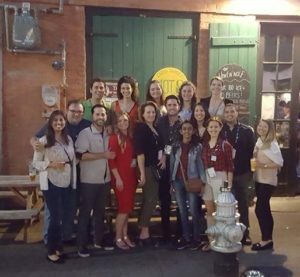 With a total of 16 students, accompanied by Dr. Ryan, the SDSU PSO headed off to New Orleans where they were greeted with the sounds of live jazz music, smells of rich Cajun foods, and the lure of southern hospitality and charm. In an effort to get the most out of the experience, students attended mobile workshops, sessions, and networking events, while exploring the city in any downtime they could find. The mobile workshops offered by the NPC were a favorite of the students and included tours of the city by bicycle and bus, as well as tours of various neighborhoods, historic districts, and even swamps. These mobile tours offered a unique insight into the culture and history of development within the city of New Orleans. Some students hopped on the local bike-share and created their own mobile tours, exploring as far as they could before getting back in time to catch another session. The conference was a first for many, and even the first time on an airplane for one student. The PSO returned to San Diego with new insight into the most up to date planning techniques and tools as well as current issues, trends and innovations in the field. Much was learned about housing, public engagement, homelessness, gentrification, equity, and more; leaving the students with advanced knowledge to encourage thoughtful research and planning. The experience not only left the students feeling further inspired for their studies, but also sparked excitement for their upcoming careers in the planning field. These future planners are motivated and ready to face the challenges that the profession has to offer.